Editor’s note: Andy Arnold ran for LetsRun.com co-founder Robert Johnson at Cornell for three years (he ran under Zeb Lang his final year) and did a fifth year at Ohio State under Brice Allen. A 4:18 performer in HS, Arnold improved to PRs of 3:47, 8:09, 14:09, and 29:35. Johnson, Arnold and a slew of others went to Kenya in 2011 and Arnold caught the Kenyan bug. An anthropology major, Arnold recently received a Young Explorers Grant from National Geographic and thanks to that funding and the support of many others, including LetsRun.com, Andy will be in Kenya for the next six months. 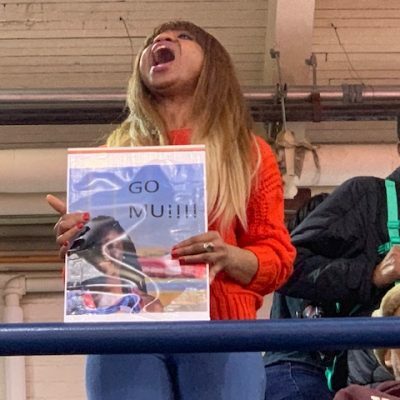 NAKURU, Kenya – The IAAF World Indoor Championships in Portland, Or., were certainly the center of attention for track fans worldwide this past weekend. But in Kenya, most of the excitement revolved around a small athletics meet held in the city of Nakuru last Friday. After attending the races, I can understand why, for it arguably assembled the largest and most talented fields of distance runners outside of a Diamond League meeting or a World Championships/Olympics. Last year, a record 1,400 athletes competed in the Nakuru races, and this year came very close to eclipsing that mark. A few of the big names were missing (notably David Rudisha and runners at World Indoors such as Caleb Ndiku, Isiah Koech and Augustine Choge), but there were a ton of Kenyan stars at this meet. Elites as well as amateurs came out in droves, with icons such as Asbel Kiprop, Thomas Longosiwa and Timothy Kitum toeing the same line as relatively unknown locals. However, this lack of fame should not be confused with a lack of competition, as Kiprop only managed 4th in the 1,500-meter race last year. 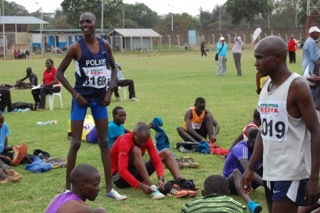 The Nakuru races held this past Friday and Saturday were of a similar caliber, and this spectacle of athletics left me with five takeaways going into the outdoor season. 1) Renato Canova says Bedan Karoki should be considered THE FAVORITE for the World Half Marathon Championships. I cannot stress enough the amount of athletes or the level of talent assembled at the Nakuru races this past weekend. 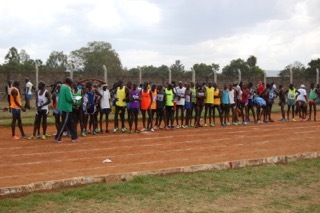 The 1,500 meters had easily over 200 athletes, the 5k over 300. And though the 800 heats were limited to a reasonable seven or eight runners per section, the 1,500 heats were huge: at least 25 guys in each race. This track meet served as a snapshot of Kenya’s entire talent pool. And yet, there was one athlete whose performances were so dominating that he stood out from all the rest. That athlete was Bedan Karoki. In Nakuru, it’s dangerous to run too close to the rail. Karoki’s winning time of 3:42 was the fastest of the day, thanks to a devastating 57-second final lap. The next-fastest time was 3:43, ran by Timothy Kitum in the third heat. 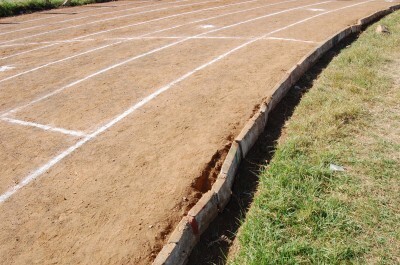 But before anyone attempts to snub Karoki’s performance, please know this: the track in Nakuru boasts a dirt surface with a broken rock railing and holes in lane one. It is also at an altitude of 6,000 feet. As if this performance wasn’t enough, Karoki returned to the track 45 minutes later to compete in one of the most loaded 5k fields I’ve ever witnessed. The 5k featured 12:49 man Thomas Longosiwa, 7:54 and 7:58 steeplers Paul Koech and Jairus Birech, 3:29 1,500 man Nixon Chepseba, as well as 50 other talented Kenyan athletes. Once again, Karoki proved to be the class of the field, crushing the competition over the final 1,200 meters with a finishing time of 13:38. His last three laps were run in 59, 57, 58 seconds each. And you thought Edward Cheserek‘s double was impressive. Standing next to me during the race was legendary coach Renato Canova. When I asked him what he thought about Karoki ahead of Saturday’s World Half Marathon Championships in Cardiff, he emphatically replied that Karoki is the favorite going into the race. He also was a quick to point out that if Karoki were his athlete, he probably wouldn’t have had him double with a 1,500 and 5k the week before a showdown with Mo Farah and Geoffrey Kamoworor. Canova was not alone in his prediction. The sentiment throughout the stadium was that Karoki was something special, and that his form is currently on another level. 2) Asbel Kiprop is focused and ready for a historic 2016. Can Kiprop possibly top his incredible 2015 season this year? 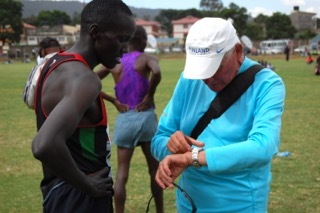 The day before the Nakuru races, I was sitting down with 800-meter runner Timothy Limo (1:46.09 PR) in Iten, discussing the prospects of Kenya’s athletes at this year’s Olympic Games. When Asbel Kiprop’s name came up, “Timo” was adamant that this would be his friend’s best year. That focus was apparent during the second heat of the 800 meters. Kiprop, sporting the dark blue singlet of the Police Force, cruised through 400 in 53 seconds before unleashing a savage last lap to win in 1:47. It was the fastest time of the day, and Kiprop made it look easy. It’s scary to imagine Kiprop getting any better than he already is. Last year he ran 3:26.69, the fastest 1,500 since 2001 (and just .69 off the world record) and cruised to World and Diamond League titles. 3) Athletics Kenya is aware of its plight with WADA and the IAAF. Last month, Kenya missed a WADA deadline to beef up its anti-doping efforts. 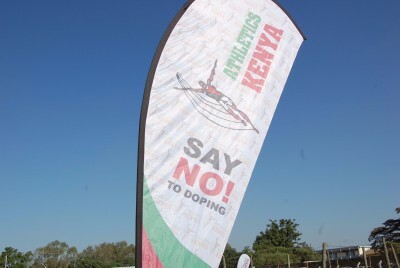 If Kenya does not pass new legislation and allocate appropriate funding to the Anti-Doping Agency of Kenya by April 5, it risks being deemed non-compliant by WADA, which could result in Kenyan athletes being banned from the 2016 Olympics. As an anecdotal aside, I attended the Nakuru meet with a Belgian friend who is planning on becoming an athletics agent by the end of the year. He recently visited AK in Nairobi to introduce himself and register with their agency. He told me that during his interview, every question asked of him had to do with doping. 4) Keep an eye on Ronald Kwemoi this year. In the first heat of the 800, I witnessed Ronald Kwemoi run 1:48 for second place. I wouldn’t have thought much more about his performance were it not for a conversation I had with Canova after the race. During that conversation, I asked Canova about the athletes currently training in his group. While he had great things to say about all of his athletes, he was especially excited about Kwemoi. Canova said he believes Kwemoi has the talent and work ethic to break the world record in both the 1,500 and 5,000. When I asked him why Kwemoi didn’t run faster in the race, he assured me that his athletes were training through this meet, and proved it by pulling out a workout sheet with some of the hardest interval reps I had ever seen. 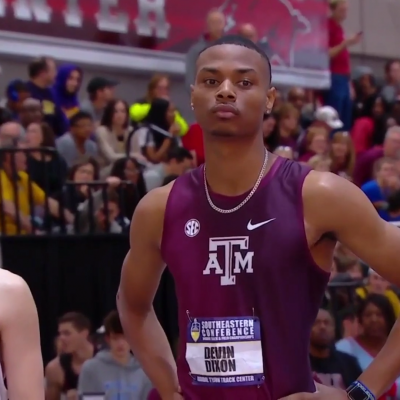 Kwemoi has already done some incredible things on the track. In 2014, as an 18-year-old, he ran 3:28.81 for 1500 (a world junior record that ties him for ninth on the all-time list), won the Lausanne Diamond League meet and earned medals at the Commonwealth Games and African Championships. Last year, he ran 3:30 and 13:16 and was sixth, fifth, third and fifth in four Diamond League races. But Canova believes that Kwemoi has yet to hit his ceiling and this is the year when the former junior standout becomes a consistent threat to the world’s best at the senior level. Timothy Limo, who trains with Kwemoi, echoed this sentiment. If this proves true, it may be that world sees two Kenyan men gunning for the first-ever 3:25 1,500 in 2016. 5) Thomas Longosiwa is a really nice guy. The heat sizes in Nakuru were huge. Here, the 5,000 runners ready for the start. After the meet ended, I found myself in a bit of a dilemma. My ride back to Iten had encountered car problems, leaving me stranded in Nakuru unless I could find another means of getting home. If you have ever traveled in western Kenya, you know that moving around is not an easy matter, least of all a three-hour road trip across the Rift Valley. I was about ready to book a hotel room for the night when one of the assistant coaches in Canova’s group said he had found me transportation. At the time, I assumed that I would be riding with the coach, but to my surprise, Thomas Longosiwa pulled up in a sharp-looking sedan with an empty seat. He had been on his way back to Iten when he heard about my predicament, and voluntarily turned around to help deliver me home. Not only was I grateful, but I was amazed at the generosity of this Kenyan superstar. Longosiwa, the 2012 Olympic bronze medalist at 5,000 and one of just 16 men in history to break 12:50, is a famous celebrity in Kenya who has earned hundreds of thousands of dollars in endorsements and prize money over the years. That’s a crazy amount of money in Kenya, where the average annual income is around $1,200, and just a third of that in western Kenya. He is also the father of three children and was on his way to spend the weekend with his family. And yet, this same man stopped what he was doing to help a complete stranger in need. Imagine a scenario where Steph Curry overhears that one of his fans needed a lift to Palo Alto after a Golden State Warriors game and rather than carry on with his busy schedule, he turns back to Oracle Arena to offer that fan a ride home. That news would be all over ESPN. When I suggested this to Longosiwa, he just laughed, saying, “I am no different from you, we are both people and people should always help one another.” I wish America had more sports icons like Thomas Longosiwa. The man is a class act. More: Talk about this article on our world famous fan forum / message board: MB: Bedan Karoki rocked a meet in Kenya over the weekend – Can he take down Mo Farah this weekend at 2016 World Half?